Well actually I don’t, I say Schemas. I honestly didn’t realise, until I started researching them, that schemata was the plural of schema! Anyway why are they significant? Well in my post about Working Memory I said Baddeley asserted that amongst the limited number of items being held in the Working Memory, and therefore available for manipulation and change, could be complex, interelated ideas; schemas. Allowing more complex memory constructs to be accessed is particularly important for Cognitive Load Theory, because if working memory is really limited to just four simple things, numbers or letters, then Working Memory cannot be central to the learning process in a lesson. What is going on in a lesson is a much richer thing than could captured in four numbers. The escape clause for this is to allow the items stored in, or accessed by, Working Memory to be Schemas or schemata. A schema is then a “data structure for representing generic concepts stored in memory” and they “represent knowledge at all levels of abstraction” (Rumelhart: Schemata The Building Blocks of Cognition 1978). To give an example of what schema is and how it is used we can take an example from Anderson (when researching this I was pointed at Anderson by Sue Gerrard), he developed the schema idea in the context of using pre-exisiting schemas to decode text. They expand by discussing how more ambiguous pieces of text with less clear cut fits to the “SHIP CHRISTENING” schema might be interpreted. ‘From a logical point of view there are three basically different modes of learning that are possible in a schema-based system. He is not keen on “restructuring”, however, because Rumelart regards a mechanism to recognise that a new schema is necessary as something beyond schema theory, and regards the induction of a new schema as likely to be a rare event. A nice illustration (below) of Rumelhart’s tuning – schemas adapting and becoming more general as overlapping episodes are encountered – comes from Ghosh and Gilboa’s paper which was shared by J-P Riodan. Ghosh and Gilboa’s work looks at how the psychological concept of schema as developed in the 70s and 80s might map onto modern neuroimaging studies, as well as giving a succinct historical overview. The figures within each circle indicate episode strengths on the normal distributions that G & G postulate occur within the encompassing schema and line thicknesses indicate associative strengths. If accretion, tuning and restructuring is starting to sound a bit Piagetian to you “assimilation and accomodation” for “tuning and restructuring” then you would be right. Smith’s Research Starter on Schema Theory (I’ve accessed Research Starters through my College of Teaching Membership) says that Piaget coined the term schema in 1926! It would be a lovely irony if the idea that allowed Cognitive Load Theory to flourish were attributable to the father of constructivists. However, Derry (see below) states that there is little overlap in the citations of Cognitive Schema theorists, like Anderson and later Sweller, and the Piaget school of schema thought, so Sweller probably owes Piaget for little except the name. Now it is not clear to me that these three are different things, they seem to represent only differences in emphasis or abstraction. CLT would surely be interested in Cognitive Fields, but Derry associates Sweller with Memory Objects. 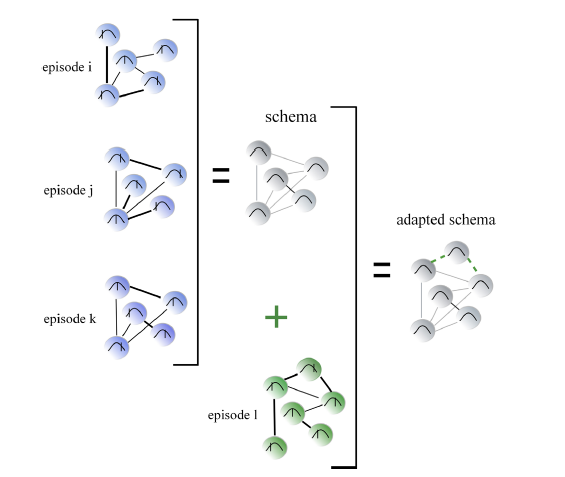 While Mental Models seems to be as much about the tuning of the schema as the schema itself. DiSessa does, however, have a different point of view when it comes to science teaching. Where most science teachers would probably see misconceptions as problems built-in at the higher schema level, DiSessa sees us as possessing a stable number of p-prims whose organisation is at fault, and that by building on the p-prims themselves we can alter their organisation. There is some evidence for the existence of schemas. Because interpretation of text is where schema theory really developed, there are experiments which test interpretation or recall of stories or text in a schema context. For example Bransford and Johnson 1972 conducted experiments that suggest that pre-triggering the corrrect Cognitive Field before listening to a passage can aid its recall and understanding. Others have attempted to show that we arrive at answers to problems, not via logic but by triggering a schema. One approach to this is via Wason’s Selection Task which only 10% of people correctly answer (I get it wrong every time). For example Cheng et al found that providing a context that made sense to people led them to the correct answer, and argue that this is because the test subjects are thus able to invoke a related schema. They term higher level schemas used for reasoning, but still rooted in their context “pragmatic reasoning schemas”. I am not sure that any of the evidence is robust, but schemas/schemata continue to be accepted because the idea that knowledge is organised and linked at more and more abstract levels offers a lot of explanatory power in thinking about what is happening in one’s own head, and what is happening in learning more generally. 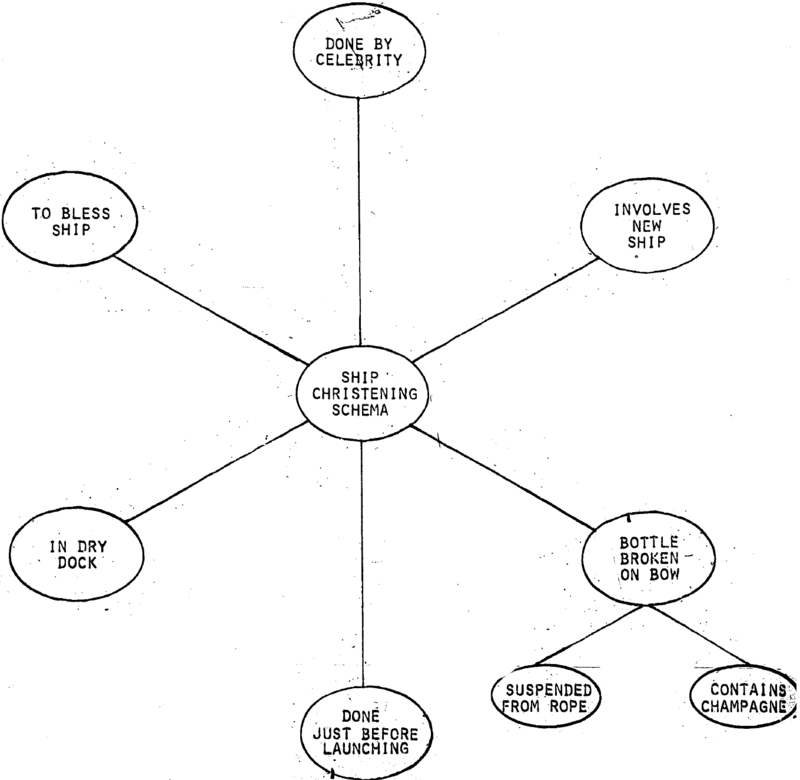 Schema theory also fits with the current reaction against the promotion of the teaching of generic skills. If we can only think successfully think about something if we have a schema for it, and schemas start off at least as an organisation of memory objects, then thought is ulitmately rooted in those memory objects, thought is context specific. I suspect that this may be what Cheng et al‘s work is confirming for us.